...and you'll want to go to that floor. A little backstory, if I may. Picture it: the year 2000. Not only were computer nerds across the globe relieved by the lack of exploding monitors and crashed Starcraft save states, courtesy of the Y2K bug, but music listeners were also starting to tire a bit of Scooter. Their latest single, "She's The Sun", had only hit #41 on the charts -- their lowest position yet -- and ennui had likely set in. So the three club rockers from Hamburg had to shuffle back into the studio and try something new, something fresh, something a bit more innovative to win back the screaming crowds. 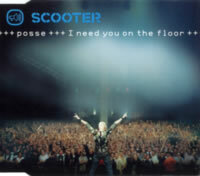 And what better way to do that than with "Posse (I Need You On The Floor)", which directly addresses their beloved posse and also provides just the dancefloor banger we all needed. Scooter returns with their stadium-filling loud dance music, and the Radio Version alone is proof of that. As soon as those initial tribal drums hit and the crowd begins shouting, you know you're in for a wild ride. And then the kicks and the wild flanged synths with a background melody not unlike The KLF's "What Time Is Love? ", frontman H.P. Baxxter heads to the microphone for some really unusual lyrics, as usual. The chorus brings back one of their classic elements -- the high-pitched voice -- which had hibernated for a number of years, telling the posse that he needs them on the floor, all over some simple but pleasant piano work. It's a high-energy track that illustrates the band heading in a more mainstream direction, but it also shows their ability to evolve through the times, as their 2000 sound wasn't quite cutting the mustard on the charts. Unfortunately, there aren't any B-Sides on this single, but there are a few more versions of Posse to enjoy. The Extended Version is exactly what it sounds like: stretching the concept to the extreme! There's also a Tee Bee Mix, and although I don't know what "Tee Bee" refers to, it's a slight remix of sorts (though not a significant one, because it basically uses elements from the original). The only notable new additions are some pads, a few cool synth effects near the end, and a "Mayday!" sample that gets really annoying after a while. Last, there's a Club Mix, and unfortunately, it reminds me too much of the Tee Bee Mix, except a bit shorter and a bit less varied.